Follow along on my first acoustic guitar build. 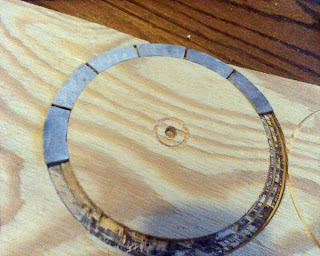 First off I'm final shaping the Petoskey stone rosette, with sandpaper. I made a channel in plywood (minus binding thicknesses) to make sure that the stones fit to make a perfect ring. This is very time consuming but I do like the results. Notice how the front stone doesn't fit perfect... I continue to remove material until it does. Here are six stones perfectly fitted – I actually did eight last night, but had to stop (my son broke his foot and had a trip to the ER – ouch!). I'm hoping make the mother of pearl spacers and then put these stones with some binding and M.O.P. in the soundboard soon but to be honest, I'm afraid of messing up the soundboard more than anything as of yet. I haven't ordered the binding but it will be white/black/white/black the white will be facing the stones and black facing the wood. 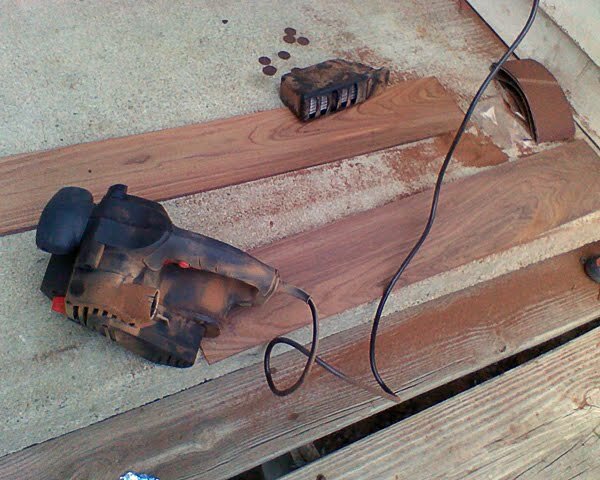 I also joined the two back boards together – and did a lot of sanding to get these closer to the correct thickness. I do have a little more sanding to do on these. I love the look but think I'm going to put a Petoskey stone channel down the center. My fellow graphic designer at VP and friend Joe M. gave me another VERY nice stone, Thanks Joe! 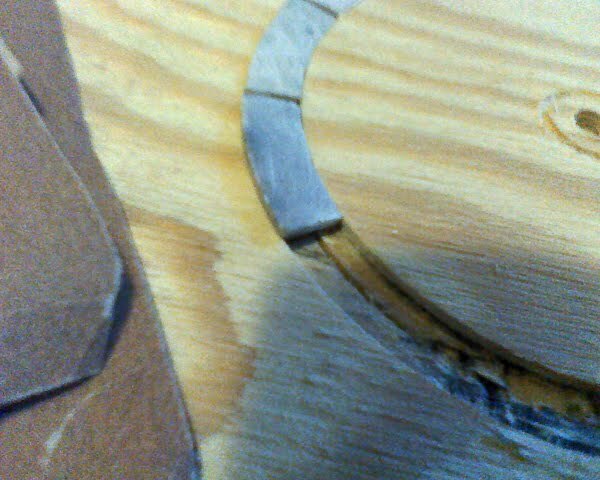 Above is the inside of the guitar back, below will be the outside of the back. I also spent a good deal of time thinning down the sides. 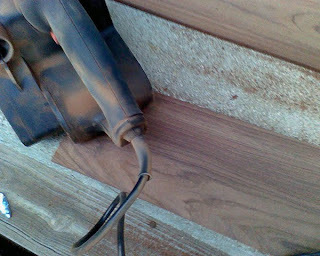 About an hour removing .05 off a quarter inch board with this sander... Then I got smart and went to my buddy David's shop to use his new (yard sale) Jointer. 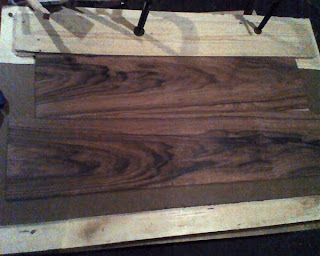 Removed a ton of material and am within .02 of the finish thickness on both boards. I also wanted to mention that I met a very talented, local luthier a few weeks ago – Ken McKay. He was incredibly supportive, gave me some great advice – and showed me his shop and his work. 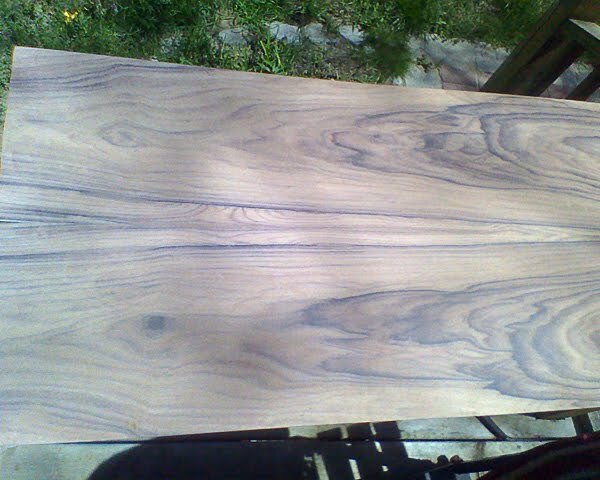 He even offered to help me out in thicknessing my boards, but I didn't want to impose on a great person I've just met. Plus, I really don't want this to become an apprentice type project (if that makes any sense – I get advice from everyone all the time...) Either way great to meet him and I hope to develop a friendship with him. Slight Diversion – Box Joint Jig.